PITTSBURG, CA -- Bishop-Wisecarver announced today the launch of its QuickTrak line, a family of modular linear guide components and sub-assemblies that help manufacturers and automation solution providers assemble machines with motion guidance systems faster and easier. 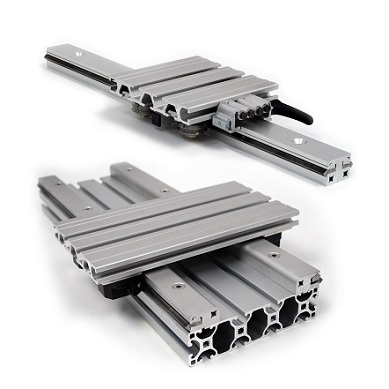 The T-nut and T-slot based kit of parts reduces downtime and total cost of ownership by allowing the user to build a linear guide system from modular, cut-to-length and easy-to-assemble parts. "QuickTrak benefits any machine builder who wants to quickly add a customized linear guidance system into their application with as little assembly and machining effort as possible," said Bishop-Wisecarver Mechanical Design Engineer Leslie Lui. "QuickTrak is unlike most linear guide products which require highly customized, precision-machined components and mounting features for application integration." Available as a kit of parts or fully assembled, QuickTrak simplifies the design process and offers fast alignment. The product comes in two sizes and two configurations which can be used much like an industrial-grade erector set, explained Bishop-Wisecarver Vice President of Engineering Ali Jabbari. "The track support sub-assemblies in QuickTrak were designed to reduce the number of hardware pieces required for fastening track to mounting substrates," said Jabbari. "Holes do not need to be drilled in the track because of our patent-pending aluminum wedge design which is used to secure the steel vee-edge track." QuickTrak wheel plates are also fast to install and customize without additional machining, consisting of wheel mounting kits assembled in T-slots on extruded aluminum wheel plates. Wheel mounting kits consist of DualVee® guide wheels, bushings, wheel covers and T-slot mounting fasteners. Wheel plates are simply cut to specified span widths, from just the minimum required to mount wheel kits to any particular width required in a customer's application. "Our customers asked for a linear guide they could install quickly and easily to new and existing machines," said Bishop-Wisecarver President, Pamela Kan. "We listened and thus created QuickTrak to meet this need." QuickTrak's adaptability and ease of assembly lends itself especially well to any machine with T-slot extrusions. QuickTrak is an ideal choice to retrofit such systems and can save money by eschewing the need to develop an entirely new machine in order to add motion guidance features. "It can immediately help customers who already use aluminum extrusions or similar beams in their machines," explained Bishop-Wisecarver Vice President of Sales Mike McVeigh, adding that QuickTrak works for virtually any industry, including metalworking, robotics, transportation, industrial machinery, architecture, consumer products, controls as well as general and lab automation, to name some. DIY enthusiasts and hobbyists could find countless uses for the guides, too. QuickTrak is backed by an engineering team focused on helping customers select the right configurations for their application needs. Once specified, QuickTrak can ship in less than a week from receipt of order. To learn more about QuickTrak, visit BWC.com. To follow company updates, go to our blog at bwcnews.blogspot.com or Twitter account at twitter.com/bwcnews. Bishop-Wisecarver Corp. is a certified woman-owned manufacturer in its second generation, and has remained one of the most respected names in custom automation solutions and guided motion technology since 1950. The San Francisco Bay Area company manufactures, stocks, and distributes guided motion components and systems for linear, rotary and curved track applications. Bishop-Wisecarver products are used worldwide in industries such as packaging, metalworking, welding, wood processing, paper industry machinery and other industrial equipment.